Schwarzkopf Professional is a market leader in the hairdressing industry and part of the Cosmetic Division within the Henkel group. The company started 111 years ago when chemist Hans Schwarzkopf launched the first hair-washing powder on the German market: Schaumpon. Today Schwarzkopf Professional covers all products in the categories of hair coloring, care and styling. Schwarzkopf, always in tune with the spirit of the times, has repeatedly revolutionized the market with technical breakthroughs and innovations. With the success of the IGORA mobile app, Schwarzkopf Professional engaged with Logic once again to develop a mobile app for their new hair color line, ESSENSITY. The new mobile app would feature the functionality of the System Educator but be based on the environmentally friendly ESSENSITY color line. Like the IGORA mobile app, this app will also be used internally by Schwarzkopf’s sales and education teams, and externally by high-end salon stylists. The new ESSENSITY app provides the user with access to Schwarzkopf’s database of thousands of formulas that have been tested and approved by the professionals at Schwarzkopf. The user retains the ability to save client formulas (in the “My Clients” section) based on target hair color, application and natural hair selections. The “Hints and Tips” section was updated with new graphics and content. To serve international staff and clients, the app can be displayed in five languages: English, Greek, French, Swedish, and Danish. Logic built in functionality that detects what language is selected in the device settings, to determine in which language the app is displayed. The user can also manually change the language choice. Logic developed new innovative features including the interactive Digital Strand Chart. The chart presents the entire ESSENSITY color line and matches target colors with a true-to-color visual hair strand. A user can select the target color and obtain the final ESSENSITY color formula. In order to emulate the philosophy and meaning behind the ESSENSITY color line, Logic designed all the graphics and the interface to mirror the organic and environmental mentality of the product. 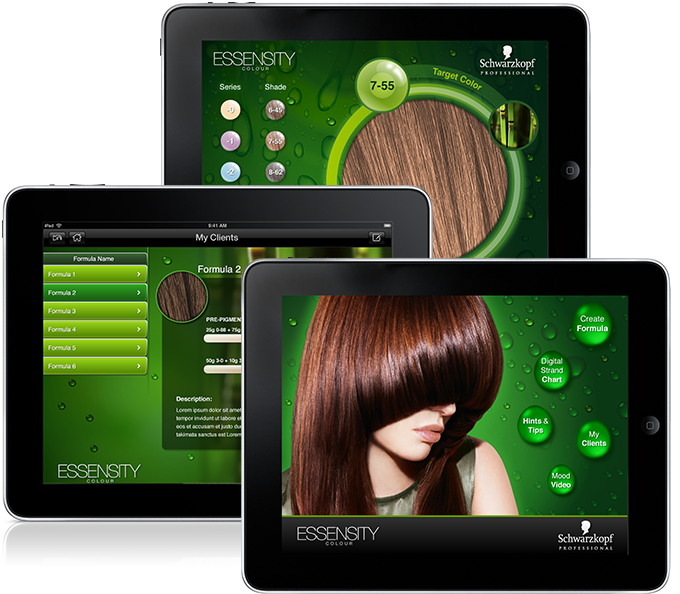 The ESSENSITY app continued Schwarzkopf Professional’s mobile strategy and commitment to cutting edge services. By providing its sales team with the new mobile app, Schwarzkopf instantly increased exposure and brand awareness of the new product line. Furthermore, the mobile app continued the process of streamlining the marketing and sales teams and reduced internal costs of printing.